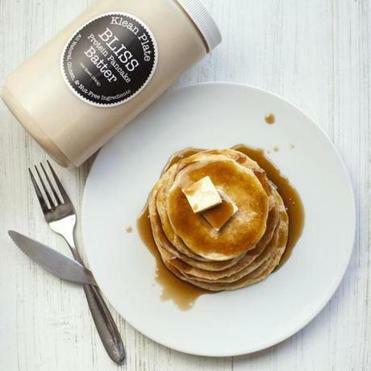 Pancakes made from Klean Plate Bliss Protein Pancake Batter. Kelly Sanders needed to fuel up with high-protein foods while training for bodybuilding competitions, but the diet left her taste buds wanting for more. “When everything was removed from my diet, I missed the texture and flavor of comfort foods,” said Sanders, 28, a nutritionist as well as a culinary school graduate, former sous chef at Petit Robert Bistro in the South End and recipe tester at America’s Test Kitchen. So Sanders developed a recipe for a high-protein batter yielding pancakes and waffles with a sweet, cake-y texture reminiscent of a cupcake. She could eat them every day while training and still meet her goals. She named her invention Bliss Batter, which she sells (about $30 a quart) through her company Klean Plate. The high-protein, gluten-free, low-carb and low-sugar batter includes cottage cheese, eggs, ground-up oats and whey protein powder, and makes delicious flapjacks for a nutrient-rich meal or snack. Available at Foodie’s Markets, 1421 Washington St., Boston, 617-266-9911 and 230 W. Broadway, South Boston 617-266-9911; Wildflower Pantry, 575 Washington St., Brighton, 617-276-6299; Olive Connection, 1426 Beacon St., Brookline, 617-879-9980; Fruit Center Marketplace, 10 Bassett St. Milton, 617- 696-5274 and 79 Water St., Hingham, 781-749-7332., or go to www.kleanplate.com.